It is above all the impersonal and economically rationalized (but for this very reason ethically irrational) character of purely commercial relationships that evokes the suspicion, never clearly expressed but all the more strongly felt, of ethical religions. Maximilian Carl Emil Weber (21 April 1864 – 14 June 1920) was a German sociologist, philosopher, jurist, and political economist whose ideas profoundly influenced social theory and social research. Weber is often cited, with Émile Durkheim and Karl Marx, as among the three founders of sociology. Max Weber, The Rejection of the World and Theodicy, 1916. Sociology is the science whose object is to interpret the meaning of social action and thereby give a causal explanation of the way in which the action proceeds and the effects which it produces. By "action" in this definition is meant the human behaviour when and to the extent that the agent or agents see it as subjectively meaningful [...] the meaning to which we refer may be either (a) the meaning actually intended either by an individual agent on a particular historical occasion or by a number of agents on an approximate average in a given set of cases, or (b) the meaning attributed to the agent or agents, as types, in a pure type constructed in the abstract. In neither case is the "meaning" to be thought of as somehow objectively "correct" or "true" by some metaphysical criterion. This is the difference between the empirical sciences of action, such as sociology and history and any kind of a priori discipline, such as jurisprudence, logic, ethics, or aesthetics whose aim is to extract from their subject-matter "correct" or "valid" meaning. Since Judaism made Christianity possible and gave it the character of a religion essentially free from magic, it rendered an important service from the point of view of economic history. For the dominance of magic outside the sphere in which Christianity has prevailed in one of the most serious obstructions to the rationalization of economic life. Magic involves a stereotyping of technology and economic relations. When attempts were made in China to inaugurate the building of railroads and factories a conflict with geomancy ensued … Similar is the relation to capitalism of the castes in India. Every new technical process which an Indian employs signifies for him first of all that he leaves his caste and falls into another, necessarily lower … An additional fact is that every caste makes every other caste impure. In consequence, workmen who dare not accept a vessel filled with water from each other's hands, cannot be employed together in the same factory room. Obviously, capitalism could not develop in an economic group thus bound hand and foot by magical means. Luther understands monasticism as a product of an egoistic lovelessness that withdraws from one's duties in the world. By contrast, this-worldly work in a vocation appears to him to be a visible expression of brotherly love, a notion he anchors in a highly unrealistic manner indeed and in contrast—almost grotesquely—to the well-known passages of Adam Smith. Both as ruling and ruled strata and both as a majority and minority, Protestants ... have demonstrated a specific tendency toward economic rationalism. This tendency has not been observed in the same way in the present or the past among Catholics, regardless of whether they were the dominant or dominated stratum or constituted a majority or minority. Therefore the cause of the different behavior must be mainly sought in the enduring inner quality of these religions and not only in their respective historical-political external situations. This striving becomes understood completely as an end in itself—to such an extent that it appears as fully outside the normal course of affairs and simply irrational, at least when viewed from the perspective of the "happiness" or "utility" of the single individual. Here, people are oriented to acquisition as the purpose of life; acquisition is no longer viewed as a means to the end of satisfying the substantive needs of life. Those people in possession of spontaneous, fun-loving dispositions experience this situation as an absolutely meaningless reversal of a "natural" condition (as we would say today). Yet this reversal constitutes just as surely a guiding principle of [modern] capitalism as incomprehension of this new situation characterizes all who remain untouched by [modern] capitalism's tentacles. Modern capitalism has as little use for liberum arbitrium [undisciplined] persons as laborers as it has for the businessman fully without scruples in the running of his company. Owing to the incapacity of the higher price-rate to appeal to the "acquisitive sense," it would appear altogether plausible to attempt to do so by utilizing the opposite strategy: by decreasing piece-rates, to force workers to produce more in order to maintain their accustomed earnings. Moreover, two simple observations seem to have held true in the past, as they do today: a lower wage and higher profit are directly related, and all that is paid out in higher wages must imply a corresponding reduction of profits. Capitalism has been guided by this axiom repeatedly, and even from its beginning, and it has been an article of faith for centuries that lower wages are "productive." In other words, lower wages were believed to enhance worker productivity. Above all, as will be repeatedly apparent in the sections below, fundamental for our discussion is the investigation of the idea of a testifying to one's belief as the psychological point of origin for methodical ethics. Finally, and of central importance, the special life of the saint—fully separate from the "natural" life of wants and desires—could no longer play itself out in monastic communities set apart from the world. Rather, the devoutly religious must now live saintly lives in the world and amid its mundane affairs. This rationalization of the conduct of life—now in the world yet still oriented to the supernatural—was the effect of ascetic Protestantism’s concept of the calling. narrow specialists without mind, pleasure-seekers without heart; in its conceit, this nothingness imagines it has climbed to a level of humanity never before attained. For sure, even with the best will, the modern person seems generally unable to imagine how large a significance those components of our consciousness rooted in religious beliefs have actually had upon culture, national character, and the organization of life. Nevertheless, it can not be, of course, the intention here to set a one-sided spiritualistic analysis of the causes of culture and history in place of an equally one-sided “materialistic” analysis. Both are equally possible. Historical truth, however, is served equally little if either of these analyses claims to be the conclusion of an investigation rather than its preparatory stage. A true prophecy creates and systematically orients conduct toward one internal measure of value. In the face of this the "world" is viewed as material to be fashioned ethically according to the norm. Confucianism in contrast meant adjustment to the outside, to the conditions of the "world." A well-adjusted man, rationalizing his conduct only to the degree requisite for adjustment, does not constitute a systematic unity but rather a complex of useful and particular traits. Persecutions of these heterodoxies ... do not account for the unusually quick victory of Hinduism. Favorable political circumstances contributed to the victory. Decisive, however, was the fact that Hinduism could provide an incomparable religious support for the legitimation interest of the ruling strata. What interests us here is the assimilative power of the Hindu life order due to its legitimation of social rank. After Nietzsche’s devastating criticism of those “last men” who “invented happiness,” there is probably no need for me to remind you of the naïve optimism with which we once celebrated science, or the technology for the mastery of life based on it, as the path to happiness. Who believes this, apart from a few overgrown children occupying university chairs or editorial offices? This naive manner of conceptualizing capitalism by reference to a “pursuit of gain” must be relegated to the kindergarten of cultural history methodology and abandoned once and for all. A fully unconstrained compulsion to acquire goods cannot be understood as synonymous with capitalism, and even less as its “spirit.” On the contrary, capitalism can be identical with the taming of this irrational motivation, or at least with its rational tempering. Nonetheless, capitalism is distinguished by the striving for profit, indeed, profit is pursued in a rational, continuous manner in companies and firms, and then pursued again and again, as is profitability. There are no choices. If the entire economy is organized according to the rules of the open market, any company that fails to orient its activities toward the chance of attaining profit is condemned to bankruptcy. Let us begin by defining terms in a manner more precise than often occurs. For us, a "capitalist" economic act involves first of all an expectation of profit based on the utilization of opportunities for exchange; that is of (formally) peaceful opportunities for acquisition. Formal and actual acquisition through violence follows its own special laws and hence should best be placed, as much as one may recommend doing so, in a different category. Wherever capitalist acquisition is rationally pursued, action is oriented to calculation in terms of capital. What does this mean? The problem — the experience of the irrationality of the world — has been the driving force of all religious evolution. The Indian doctrine of karma, Persian dualism, the doctrine of original sin, predestination and the deus absconditus, all these have grown out of this experience. Also the early Christians knew full well the world is governed by demons and that he who lets himself in for politics, that is, for power and force as means, contracts with diabolical powers and for his action it is not true that good can follow only from good and evil only from evil, but that often the opposite is true. Anyone who fails to see this is, indeed, a political infant. p. 124; Essay "Politics as a vocation"
The capacity for the accomplishment of religious virtuosos — the “intellectual sacrifice”— is the decisive characteristic of the positively religious man. That this is so is shown by the fact that in spite of (or rather in consequence) of theology (which unveils it) the tension between the value-spheres of “science” and the sphere of “the holy” is unbridgeable. 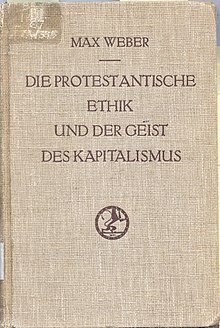 Sociology of Religion was published in 1922 as part of a posthumous collection of writings titled Economy and Society. The quotes below are from a translation by Ephraim Fischoff, published by Beacon Press in 1963. Weber's wide-ranging contributions gave critical impetus to the birth of new academic disciplines such as sociology and public administration as well as to the significant reorientation in law, economics, political science, and religious studies. His methodological writings were instrumental in establishing the self-identity of modern social science as a distinct field of inquiry; he is still claimed as the source of inspiration by empirical positivists and their hermeneutic detractors alike. More substantively, Weber's two most celebrated contributions were the “rationalization thesis,” a grand meta-historical analysis of the dominance of the west in modern times, and the “Protestant Ethic thesis,” a non-Marxist genealogy of modern capitalism. Together, these two theses helped launch his reputation as one of the founding theorists of modernity. In addition, his avid interest and participation in politics led to a unique strand of political realism comparable to that of Machiavelli and Hobbes. As such, Max Weber's influence was far-reaching across the vast array of disciplinary, methodological, ideological and philosophical reflections that are still our own and increasingly more so. Broadly speaking, Weber's philosophical worldview, if not coherent philosophy, was informed by the deep crisis of the Enlightenment project in fin-de-siècle Europe, which was characterized by the intellectual revolt against positivist reason, a celebration of subjective will and intuition, and a neo-Romantic longing for spiritual wholesomeness [Hughes 1977]. In other words, Weber belonged to a generation of self-claimed epigones who had to struggle with the legacies of Darwin, Marx, and Nietzsche. As such, the philosophical backdrop to his thoughts will be outlined here along two axes: epistemology and ethics. [...] Weber's ethical sensibility is built on a firm rejection of a Nietzschean divination and Foucaultian resignation alike, both of which are radically at odds with a Kantian ethic of duty. In other words, Weber's ethical project can be described as a search for a non-arbitrary form of freedom (his Kantian side) in what he perceived as an increasingly post-metaphysical world (his Nietzschean side). According to Paul Honigsheim, his pupil and distant cousin, Weber's ethic is that of “tragedy” and “nevertheless.” [Honigsheim 2003, 113] This deep tension between the Kantian moral imperatives and a Nietzschean diagnosis of the modern cultural world is apparently what gives such a darkly tragic and agnostic shade to Weber's ethical worldview. 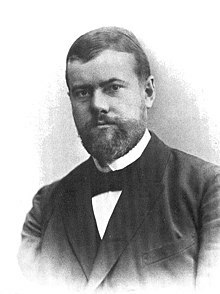 Then the works of Max Weber, first translated from the German in the 1940s — he wrote around 1910, incredibly — began to find their way into social science thought. At first, with his celebration of the efficiency of bureaucracy, he was received with only reluctant respect, and even with hostility. All writers were against bureaucracy. But it turned out, surprisingly, that managers were not. When asked, they acknowledged that they preferred clear lines of communication, clear specifications of authority and responsibility, and clear knowledge of whom they were responsible to. They were as wont to say "there ought to be a rule about this," as to say "there are too many rules around here," as wont to say "next week we've got to get organized," as to say "there is too much red tape." Gradually, studies began to show that bureaucratic organizations could change faster than non-bureaucratic ones, and that morale could be higher where there was clear evidence of bureaucracy. [Weber] formulated the idea of methodology to serve, not simply as a guide to investigation but as a moral practice and a mode of political action.